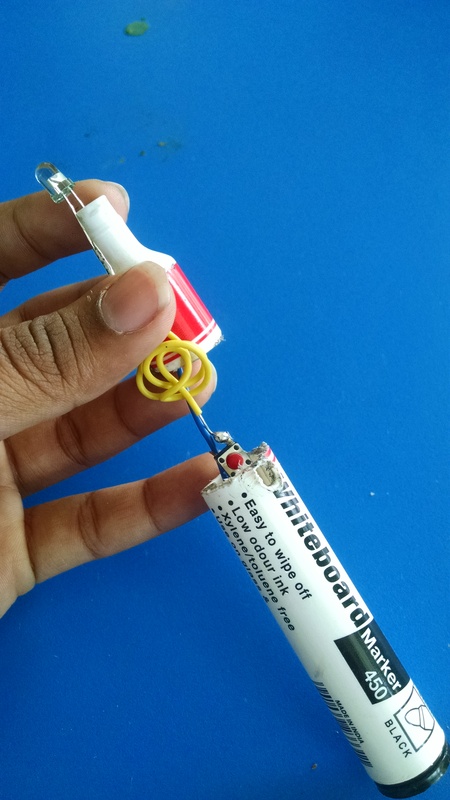 This allows us to convert any flat projected display or computer display into an interactive whiteboard. It fulfills this with the use of the Wii remote(part of the nintendo Wii gaming console) and an infrared(IR) light emitting pen(can be made easily). The software translates data from the Wii Remote's infrared camera when viewing the IR pen to control the mouse cursor on a computer. The Wii remote must be positioned to view a display or projector and an infrared emitting pen is used like a stylus. Take a marker and disassemble it by taking off the bottom cap and pulling out the insides. You should be left with just the marker casing, which will be used as the Infrared Pen's body. Take the marker casing and cut it in half lengthwise . 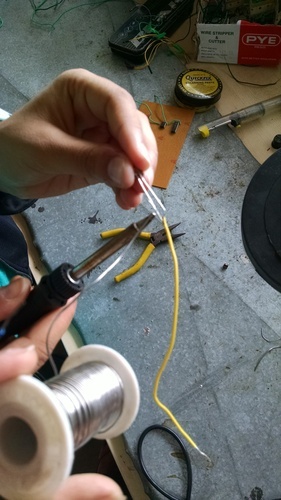 After that is complete, lay the circuit in the pen body and mark where to cut a spot for the switch. Next, tape the circuit into the marker casing, and make sure that the IR LED sticks out of the top of the pen body. Tape the second half of the pen body to the rest of the pen body. Test the Infrared pen in front of a camera. When the switch is pressed, the IR LED should emit purple light, which is invisible to the naked eye. We had to download a program from the Internet. Computers operating on Windows have a few more options. You can download one off of uweschmidt.org, smoothboard.net, or Johnny Chung Lee's original software at johnnylee.net/projects/wii/. When there, you will have to scroll down to Low-Cost Multi-point Interactive Whiteboards and click on Wiimote Whiteboard v0.3. For macs, the one we were able to find was the one at uweschmidt.org. On Linux, we used the Python-Whiteboard application. Next up is connecting the Wiimote to our computer. For Windows and Linux, if the computer has built-in Bluetooth, the computer should have easy prompts to follow. Click 1 and 2 on the wiimote simultaneously to sync it. After syncing the Wiimote, you must place the Wiimote in a spot where it will be able to sense the Infrared's movement. This step is the least predictable and sometimes the most difficult part of the whole Wiimote Whiteboard process. A Nintendo Wiimote has a viewing angle of about 45 degrees. The Wii-remote can be kept steady with the help of a tripod and the height should be adjusted such that the remote points at the centre of the screen. The distance from the screen can be determined according to the screen size being used. The last step for actually setting up the Wiimote Whiteboard is calibration. Start by opening up the Wiimote Whiteboard program. 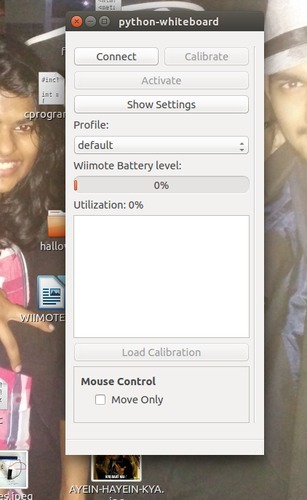 Click on the "Calibrate" button, it should be obvious. A nearly blank screen should pop up with a tiny crosshair in the upper left-hand corner. Put the IR LED right in the center of the crosshair then press the switch. A new crosshair should pop up, and again use the Infrared pen to "click" on it. Repeat this until the calibration screen goes away. This step is crucial because it determines how accurate the Wiimote Whiteboard will be. 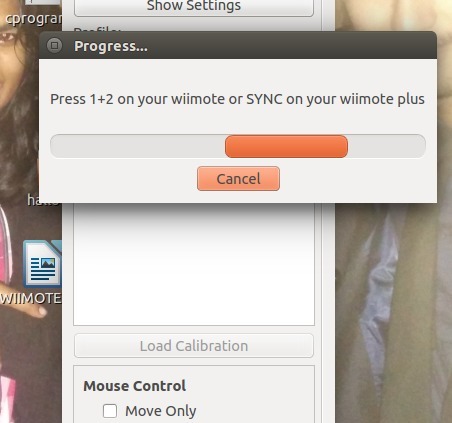 If the "clicking" does not seem accurate enough, the calibrating can be re-done as many times as you would like. To calibrate again, just re-click "Calibrate" and repeat the crosshair prompts. Any visible IR source will trigger mouse events and manipulate the computer. Any unintentional IR sources may result in undesired behavior. Also, we have to be careful as to where we point the wiimote. The wiimote should be placed on a flat surface and should not move around. This electronic whiteboard is very cheap when compared to the actuall electronic whiteboards sold in the market. We chose this topic for our mini project as we wanted to introduce this to IIIT-D. Many colleges outside India use this whiteboard for educational purposes. It can be used anywhere and is a great tool for teaching and can be used as an alternative to whiteboards.